On Roy's 59th birthday, October 3rd 2003, something happened during the course of a performance wherein Roy was dragged by the throat by one of his white tigers. I will only characterize it as that, for the time being, because there are divergent stories as to what exactly happened. So, we will wait until Roy can tell the world what occurred. Until then, I will just say he was dragged by the throat, which left him in critical condition. We will use my "Time Pill" rule* of interpretation. Roy was in a Rahu-Moon-Mars period. Both Rahu and Moon govern physical health, happiness, and well-being. Rahu governs these matters because he resides in the 1st house and consequently inherits those significations. The Moon is the functional 1st house lord, and therefore inherits those very same significations. Mars naturally rules violent acts, but it also has its positive side, and so does not truly reveal much in the natal chart unless you turn to the divisionals. In doing so, we see that in the Ashtamsha (8th divisional chart), Mars is conjoined with his sole enemy**, thus very negatively activating the significations of this divisional chart. We also see, in the Sashtamsha (6th divisional chart), that Mars rules the ascendant, and resides in the 6th house where he is aspected by his sole enemy. So, both divisional charts become activated during a Mars period, and have the potential to trigger health and death matters. The main relevant feature I believe the Solar Arc chart brings out is the conjunction of Solar Arc Pluto with Transit Sun and Natal Sun. I think Marcia Starck analyzes this conjunction nicely when she assesses the effect of transit Pluto to the Sun. Although we are speaking of Solar Arc Pluto here, the distinction is irrelevant as the same interpretation applies, since it is the same energetic connection. Those who have followed this story will see the relevance as it is known Roy was having difficulty with blood pressure and mini-strokes, which is thought to have played a role in the "attack". 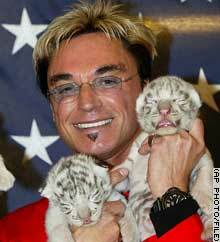 It has been conjectured that Roy was having a mini-stroke on stage and the tiger, sensing his distress, attempted to carry him away from danger. I felt the Solar Arc chart would be especially relevant in this case, since the event occurred exactly on Roy's birthday. * The Time Pill rule states that, while all significant events that will occur in your life are manifest in the natal and divisional charts, the vimshottari dasa is in effect a capsule full of tiny time pills set to release these events at various times throughout life. As such, the mahadasa lord colors the period, the bhukti lord indicates the trend or general area(s) of concern, and the pratyantardasa lord indicates the cause of the event. By properly reading the vimshottari dasa, you can tell when each natally indicated event will occur. ** Sole Enemy within divisional charts is a Sheshadri Iyer principle. The 6th lord in the vimshottari dasa system from the planet in question becomes his sole enemy. For example, let's consider the cycle of planets in the vimshottari dasa system is Ketu, Venus, Sun, Moon, Mars, Rahu, Jupiter, Saturn, Mercury. Since Jupiter is 6 positions from Venus, it means Jupiter is the sole enemy of Venus. If Venus is conjoined or aspected with Jupiter in a divisional chart, that divisional chart is negatively activated during a Venus period.